Do you know that who want to be a millionaire (WWTBAM) tv game show has helped a lot of people in the country Nigeria, the popular tv game show was launched in 8 October 2004 and was being sponsored by MTN Nigeria which had just pulled out. However, noticed came that the who wants to be a millionaire (WWTBAM) tv game show will no longer function due to lack of sponsorship between lately June 2017. But just today It has been revealed that the popular TV game show, Who Wants to be a Millionaire, will make a return next month, two months after MTN pulled out as a sponsor. The show which went off the air in June, will return on the month of September 3, according to the organisers. “We are pleased to inform the general public that the popular family quiz program ‘Who Wants To Be A Millionaire? Nigeria’ will return to TV on the 3rd of September 2017". “New season, new sponsors, whooping cash prizes to be won. Don’t miss any of the episodes,” a statement released on Tuesday said". Airopay, the new sponsors of Who Wants To Be A Millionaire, is a global international payments operator which “offers a secure, fast and inexpensive way to send and receive money via bank accounts and mobile wallets”. It is yet to be confirmed if the formal host "Frank Edoho" will continue as the host of the game show. 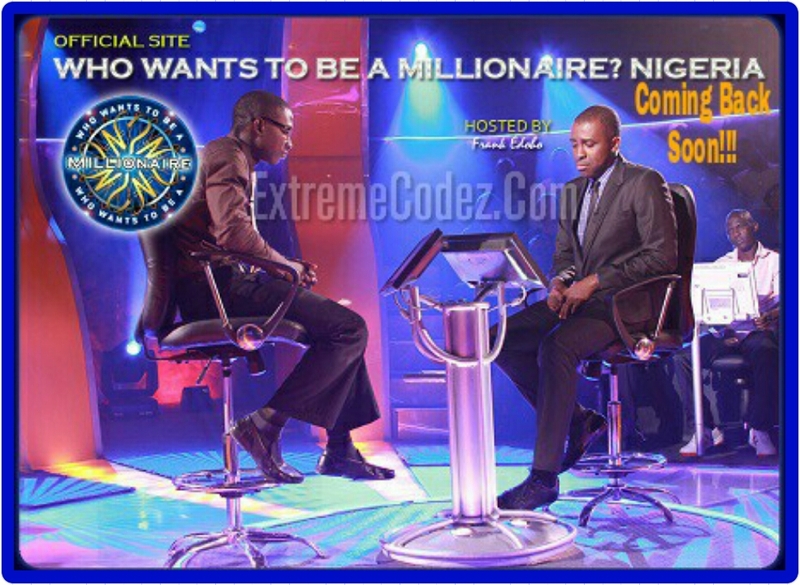 Who Wants to be a Millionaire began airing on Nigerian television in 8 October 2004. What do you think? Don't forget to share your thoughts about the coming back of who wants to be a millionaire.